In order to minimize wait times, audition appointments are strongly recommended. To make an appointment, visit the link directly below (preferred) or e-mail dan@villagerstheatre.com. Walk-ins will also be accepted but seen as time permits. Callbacks, by invitation only, will take place on Sunday, March 24, 2019, time to be determined. All roles are open. Performers are asked to prepare a 32 measure cut of a musical theatre or pop song, and to bring sheet music in the correct key; an accompanist will be provided. Pre-recorded accompaniment or a capella auditions will also be accommodated. It is requested that you do not sing a song from the show. All performers auditioning will also be asked to learn and perform a dance combination at the initial audition. Please dress comfortably. A theatrical resume and headshot are requested but not required. Rehearsals will begin the week of April 1st. 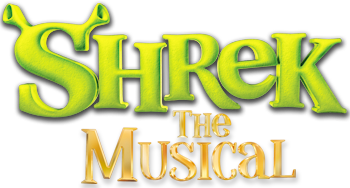 June 2-6, 2019 – All cast members are required to be in attendance for tech rehearsals. Princess Fiona (18+) – The beautiful princess of Far Far Away, she transforms into an ogre every night when the sun sets. Rescued by Shrek and eventually falls in love with him. Quirky, blunt, and multitalented, she is not an ordinary princess. Donkey (18+) – A talking donkey who joins Shrek on the run from Farquaad’s guards. Quite the chatterbox, he is not deterred by Shrek’s looks and practically forces himself into his good graces. Easily frightened and pushy, but also an optimistic with heart. Lord Farquaad (18+) – The comically short, ruthless ruler of Duloc. He is in search of a princes to marry so that he can become king. Has an intensely unfair bias against fairytale creatures that stems from a resentment of his father. Self-absorbed, lonely, and cruel. Dragon (18+) – A dragon that has been charged with guarding Princess Fiona in her isolated castle. She eventually falls in love with Donkey and attempts to keep him there forever. Imposing and flirtatious, but tired of her job as the glorified baby-sitter. Pinocchio (18+) – The leader of the fairytale creatures. He is an animated puppet whose nose grows every time he lies. Plenty of sass with a penchant for lying. Gingy (18+) – A gingerbread man initially kidnapped by Lord Farquaad. His wit and resolution help him both avoid trouble and inspire the rest of the fairytale creatures. Young Fiona (7-12) – Princess Fiona as a little girl. Sings a solo in “I Know It’s Today” with Teen Fiona and Fiona. Teen Fiona (12-18) Princess Fiona as a teen girl. Sings a solo in “I Know It’s Today” with Young Fiona and Fiona.